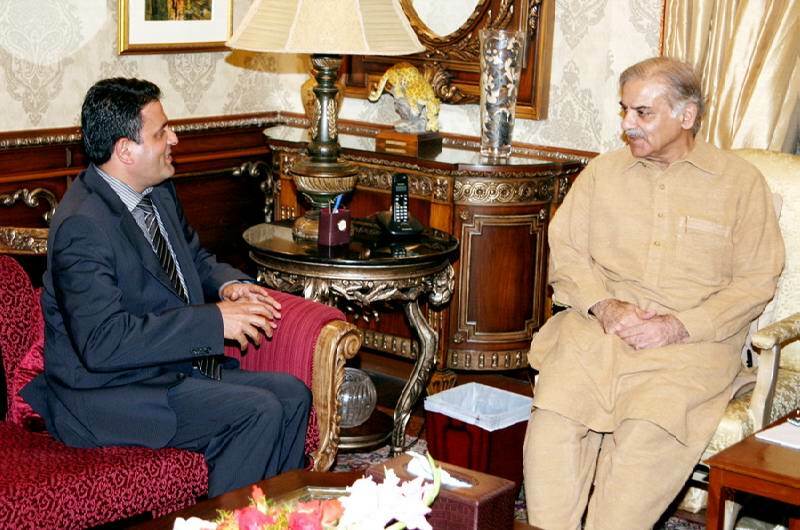 Lahore: Coordinator to Punjab CM in Germany, Shahid Riaz Gondal called on the Punjab Chief Minister Muhammad Shahbaz Sharif here, today. Organizational matters of PML-N in Germany, problems faced by overseas Pakistanis and the progress in the wake of visit of Chief Minister Punjab to Germany were discussed during the meeting. Talking on the occasion Muhammad Shahbaz Sharif said that overseas Pakistanis are playing an important role in the development and prosperity of the country and they have always taken active part in helping their Pakistani brethren in every hour of trial. He said that overseas Pakistanis have provided unprecedented financial assistance for the earthquake and flood affectees. Appreciating the services of Shahaid Riaz Gondal in Germany, Muhammad Shahbaz Sharif said that Shahid Riaz Gondal has played an important role for making his recent visit to Germany successful. He said that Shahid Riaz Gondal is performing that task which should be done by Pakistani Ambassador. Shahid Riaz Gondal said that the recent visit of Chief Minister Punjab to Berlin has been successful which has opened new vistas of bilateral cooperation in various sectors between Germany and Punjab. He termed the agreement of Punjab government with a renowned company of Germany in solar energy as an important step which would be helpful in overcoming energy crisis. He said that the image of Pakistan has restored due to the visits of Chief Minister Punjab Muhammad Shahbaz Sharif to foreign countries and new opportunities of development will be created in Punjab due to his efforts.